Bold and the Beautiful spoilers reveal a serious stalemate in the triangle involving Liam Spencer (Scott Clifton), his pregnant wife Steffy Forrester (Jacqueline MacInnes Wood), and his newly returned first love Hope Logan (Annika Noelle). Ever since Liam discovered the paternity test results in Steffy’s purse revealing the awful truth that Steffy slept with Liam’s father Bill Spencer (Don Diamont), Liam’s life has been a mess. B&B spoilers remind us that Liam served Steffy with annulment papers and left his ring at the cliff house. He also quit working for his father’s company and seemingly cut all ties with Bill, especially after the shocking reveal that Liam seemingly shot his father. Liam has definitely had a tough time in the past couple of months, but he has had one surprising ally in all of this mess. Hope returned home recently and vowed to support Liam’s marriage to Steffy. But once Sally Spectra (Courtney Hope) revealed to Hope that all was not as it should be in Liam and Steffy’s supposedly happy home. Hope decided to be a friend and support Liam. Even though Hope tried her best to get Liam to go home to his wife, once she learned the truth about Steffy’s cheating, that completely flipped the script for Hope. In addition to Steffy’s actions, Hope is dealing with her own blossoming feelings for Liam, according to recent The Bold and the Beautiful spoilers. 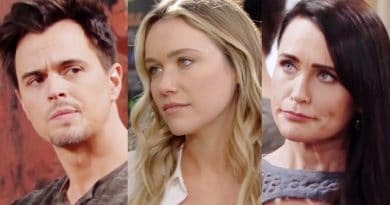 The Bold and the Beautiful spoilers promise that Hope tried to put her feelings aside for the sake of the family that Liam and Steffy are starting, but recently she found that she couldn’t keep quiet. After confessing how she felt, Hope and Liam shared a steamy kiss. B&B spoilers from She Knows for next week reveal that Liam and Hope kiss again. Adding to Liam’s confusion is Steffy begging for his forgiveness and wanting him to come home. But Liam just can’t seem to get past what Steffy did with his father, even for the sake of the baby girl she is carrying, and he finds himself being drawn closer and closer to his first love, Hope, whom he never truly got over. Liam can’t seem to find any peace anywhere, but B&B spoilers seem to indicate that there is about to be some movements in this twisted triangle as decisions are made. CBS Soaps in Depth spoilers say that Hope is going to offer Liam a place to stay and he is going to accept. Check out other twisted B&B pairings! Bold and the Beautiful fans know that Liam moving in with Hope is not going to sit well with Steffy. How will she react when she finds out that Liam and Hope are not only working together right under her nose but cohabitating as well? Steffy won’t be the only one to take this news badly. Ridge Forrester (Thorsten Kaye) will surely have something to say about the new living arrangement! Does this shift mean Liam and Hope are back together for good? What about Steffy? Where does this new move leave her? Will Steffy continue to fight for her decimated marriage or will she call it quits? How will Dollar Bill factor into all of this? Does this move finally clear the path to the life he wants with Steffy and will she finally accept his proposal? Watch CBS every weekday for the latest B&B episodes and come back to Soap Dirt for the Bold and the Beautiful spoilers you want! ← ‘Days Of Our Lives’ Spoilers: Chloe Tempted – Will She Choose Lucas Or Wreck Their Love? I love all soaps and reality TV. I have an encyclopedic knowledge of soap history, characters, and lore. I live in the beautiful state of Florida. I’m 40 and have a beautiful 17-year-old daughter. I am an avid reader and writer who loves amusement parks, sports of all kinds, but especially baseball and football. I love hanging out with my brothers and sisters of which I am the oldest. I also enjoy spending time with my nieces and nephews who are the light of my life! ‘Bold and the Beautiful’ Spoilers: Brooke’s Mistake With Taylor Puts Baby Kelly at Risk?